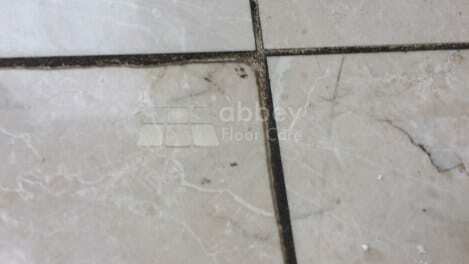 This marble cleaning project came about because our client had a marble floor in desperate need of restoration. The floor was 10 years old and showed signs of its age. It had ingrained soil, scratches and had lost its original deep shine. There was excess lippage of up to 5mm in height difference between some tiles. 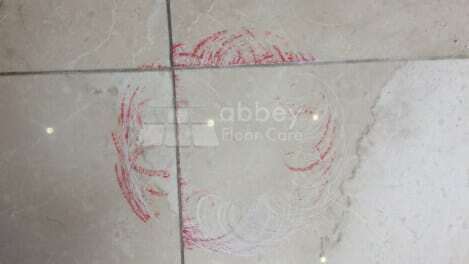 Click here for a more in-depth explanation of lippage and the impact it has on stone floor cleaning and polishing. 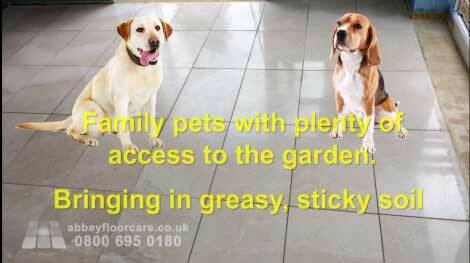 The home also has two dogs that have free access to the garden. The dogs carry soil and grit onto the floor. Also, the oils from the dogs made the soil very sticky and even more difficult to remove. The grout was also stained black from cleaning products, emulsified soil and oils soaking into the grout lines. 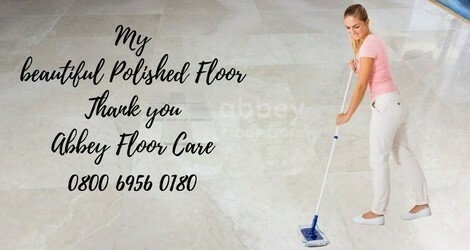 Our client tried lots of different cleaning methods to keep the floor clean, but he could not get it clean. 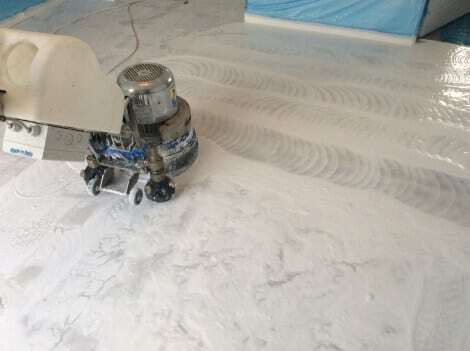 The first job was to remove all the lippage and grind the floor flat using our planetary grinding machine and 30 grit sintered metal diamond tooling. 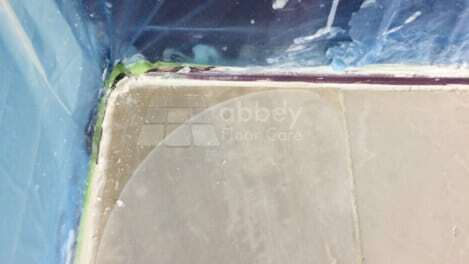 30 grit diamond tooling is very aggressive, and whilst it removes the lippage and makes the floor nice and flat, it does leave deep scratches. So we used 50 grit metal diamond tools to remove the deep scratches and prepare the floor for honing. This corner image demonstrates how deep we had to grind to make the floor surface flat. We used electric hand tools to grind and polish the corners and edges. We started honing the floor with 100 grit diamonds. And progressively honed the floor with finer diamonds, finishing at 3,000 grit. The floor now had a high sheen, ready for final polishing. 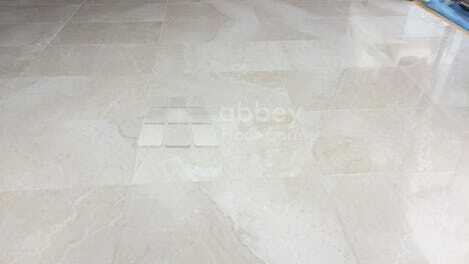 The floor was polished with marble polishing powder, resulting in a brilliant lustrous shine. 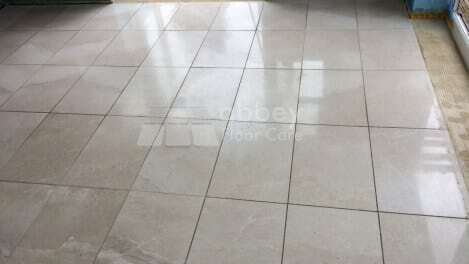 Finally, we applied a high quality impregnating sealer to help protect the marble from staining and aid cleaning. We explained the importance of daily dry cleaning and damp mopping with a microfiber flat mopping system and a marble cleaning chemical. 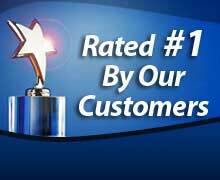 We provided the client with comprehensive instructions including the best cleaning equipment and marble cleaners. 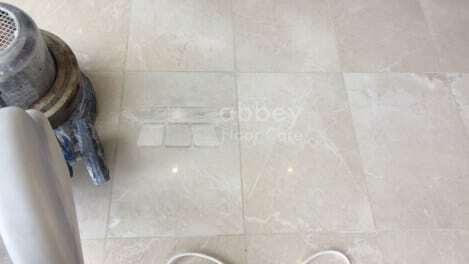 If your marble floor has lost its shine and looks dull and grimy, please contact Abbey Floor Care for a free no-obligation marble polishing quotation.